Bluetooth, Heated Seats, Rear View Camera, SYNC, SiriusXM! Hurry on this one! Marked down from $21488 - you save $5800. In the popular, competitive field of compact crossovers, the Ford Escape stands out for its sharp looks, well-appointed interior, and engaging driving dynamics. This 2014 Ford Escape is for sale today in Mission. Although there are many compact SUVs to choose from, few have the styling, performance, and features offered by the 5-passenger Ford Escape. 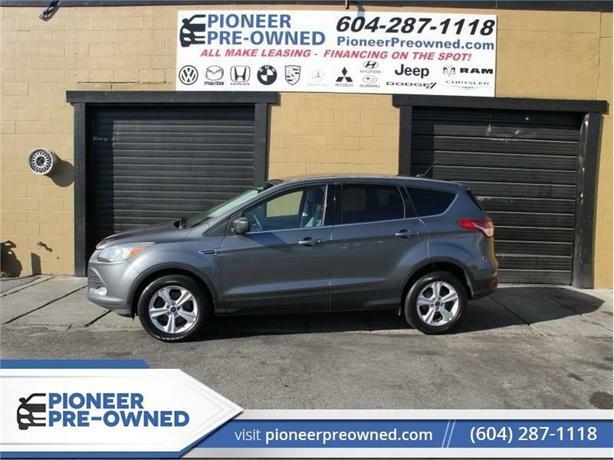 Beyond its strong drivetrain options and handsome styling, the Escape offers nimble handling and a comfortable ride. The inside of the Ford Escape boasts smart design and impressive features. If you need the versatility of an SUV, but want something fuel-efficient and easy to drive, the Ford Escape is just right. This SUV has 97523 kms. It's grey in colour and is completely accident free based on the CARFAX Report. It has a 6 speed auto transmission and is powered by a 173HP 1.6L 4 Cylinder Engine. This vehicle has been upgraded with the following features: Bluetooth, Heated Seats, Rear View Camera, Sync, Siriusxm. Our Escape's trim level is SE. The mid-range SE trim adds some nice features to this Escape. It comes with 60/40 split folding back seat, air conditioning, power windows, power locks, remote keyless entry, SYNC with MyFord which includes Bluetooth and SiriusXM, steering wheel mounted audio and cruise control, heated front seats, a rearview camera, aluminum wheels, fog lamps, dual bright exhaust tips, and more. To view the original window sticker for this vehicle view this http://www.windowsticker.forddirect.com/windowsticker.pdf?vin=1FMCU9GX2EUD53926.